Quality matters when it comes to one-stop machining and assembly. Many industries rely on professional Massachusetts precision machining to complete specific tasks that are vital to their ongoing success. Without these services, many operations would have to invest in machinery and hire skilled labor that would increase their bottom line, possibly putting them out of business. Firms and organizations all throughout the New England region rely on our precision machine shop to provide them with a variety of services ranging from engineering and prototypes to mass production and assembly. At AMI Machining, our one-stop machining and assembly services deliver quality results for orders of all sizes reaching across many different industries. When consistency, dependability, quality, and reliability matter, our customers can’t rely on just any machine shop in Massachusetts to complete an order. Clients must choose a precision machine shop that can handle the type of work that they need to be done at the volume that they require. They must also be able to meet deadlines and deliver additional services necessary to ensure quality control. Massachusetts precision machining services need to have the resources, qualifications, equipment, training, and experience required to handle challenges presented during production. The more you can learn about the company providing the one-stop machining and assembly before you hire them, the better. One way that a machine shop in Massachusetts can prove its abilities is to share examples of previously completed projects. Someone can claim to have experience or to have worked on many different types of projects, but those who are proud of their work will likely show it off on their website or in a portfolio. 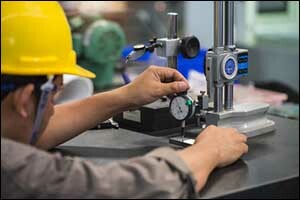 While some clients may require confidentiality, a great deal will allow the precision machine shop to use them as a reference, especially if they were pleased with the work. A portfolio helps prospective clients to see a visual example of the type of craftsmanship and quality that they can expect with their order. Contact the Massachusetts precision machining company direct to ask about viewing samples of their work. This will prove their knowledge and experience with particular projects and help you to have greater confidence in the quality of work that they can produce. Once their skills are demonstrated, you will know what they can do and whether they will be able to meet the requirements of your project. You can also ask for references and contact past customers. This will help you make a decision about working with the precision machine shop, especially for important projects that require strict attention to detail and consistent results. Whenever you work with a vendor, you need to know that they will be able to communicate with you effectively throughout the project. This is especially true at a one-stop machining and assembly service where everything will be done in-house. Whether you go to them for engineering and prototype work or if you need an order filled according to your specifications, you will want to make sure that communication is satisfactory. When changes are needed, if questions are required, or if additional orders are requested, you will want to get a call back right away. A company that has poor communication skills probably won’t get a lot of return business. Other communications skills that are necessary for a professional machine shop in Massachusetts include spending the time with each client to go over the capabilities needed to complete the job effectively. The shop should ask the client critical questions regarding the project to provide the best return on their investment. The precision machine shop should allow the client to set the tone for communication, using email, telephone, cell phone, text, or fax based on their preferences. A single point of contact is also an excellent service for one-stop machining assembly to ensure that everything gets handled effectively and efficiently. At AMI Machining, we have all of the knowledge, experience, training, and equipment necessary to provide our clients with a high level of quality assurance for all of their electro-mechanical assembly at our Massachusetts precision machining shop. We specialize in machining precision components for many different industries, including aerospace, defense, industrial, transportation, medical, telecommunications, electronics, and semiconductors. We are veteran-owned, ITAR registered, and ISO 9001 certified. Our team use state-of-the-art equipment and provides 100 percent verification at each production interval along with continuous in-process inspection for results that will meet or exceed your expectations. To learn more about AMI Machining and the type of work that we do at our precision machine shop in Massachusetts, give us a call at 508-947-1192. Our goal is to become your one-stop source for all machining and assembly requirements. Call today for a FREE estimate or to get started on your next machining and assembly project.